Llama Alarm Clock is a Simple, easy to use, customizable Alarm Clock written in JAVA - Works on Linux and Mac as WELL as Windows!!!! Llama Alarm Clock is a simple, easy to use, alarm clock. 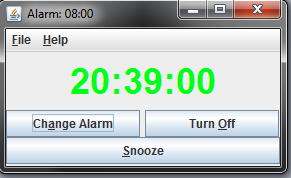 You can display a 12 or 24 hour clock and set alarms in either form (they work regardless of your display mode) and plays any .wav media file you choose to wake you up ***NOW SUPPORTS .MP3 FILES*** (Thank you Jake Rooney). It comes with 2 alarms (If you have version 1.3 make sure to use the new default ones). Uses JLayer to play mp3 files. Make sure you're downloading the latest version (1.6 currently), recently 1.5 just got a whole bunch of new downloads and it has a bug for the AM alarms that was fixed in 1.6.